is the product of the merger of two smaller churches. 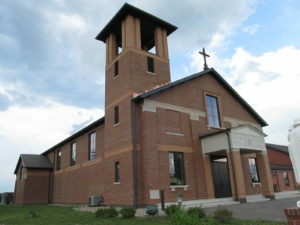 Just over 150 years ago, Cardington St. Joseph Church was established as a mission of St. Mary Parish in Delaware, Ohio. There were times when Mass was not celebrated in Cardington for long periods because of the small number of Catholics in the county. During the 1930s, more Catholic families settled in the county and Mass resumed on a regular basis. In 1971, land was purchased along US Highway 42, halfway between Cardington and Mount Gilead, to allow for the construction of a new church building. The name of the parish, Sacred Hearts, honors the Sacred Hearts Fathers who served the area for many years. A disastrous fire destroyed that building on Thanksgiving Day, 2013. A rebuilding effort was launched immediately, and the new church, offices, and social hall were dedicated on Thanksgiving Day two years later. Rosary immediately following Thursday morning Mass. Doors open at 7pm, Meeting starts at 8:00pm and goes until 9:00pm.  Chaplet of Divine Mercy to be said in the church.